To call the Eight/10 Bar & Grille a neighborhood restaurant is to shortchange it. Yes, that’s what the owner, Richard Sasso, had in mind when he opened nearly three years ago. But it’s a cut above the usual local joint, from the sleek bar to the extensive menu of some very good traditional Italian food. Sasso took what used to be a dive bar and turned it into a 68-seat restaurant. His family is from Avellino in southern Italy, and many of the recipes are his grandmother’s and mother’s. The bread, pizza dough, and sauces are made here daily. We start with crisp, chewy calamari ($8.35), fired by cherry peppers and tamed by a side of marinara sauce. 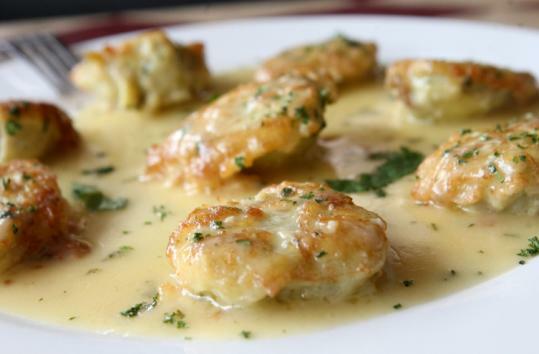 Artichokes Francaise ($7.95) are a good choice, too: half a dozen large circles cut down to the heart, egg-battered, and sauteed in a lemony sauce softened with butter and white wine. They’re velvety and pack a tart taste. The thin crust on the quattro formaggio pizza ($9.50) is crunchy, and the pie is blanketed with melted cheeses. Sweet dabs of ricotta on top are nice but innocuous; we prefer the bite of gorgonzola. The Eight/10 gets crowded on Saturday nights, which is when Elvis impersonator Al Fortucci takes the microphone and belts out songs fit for the King. He also does Sinatra, Dean Martin, Roy Orbison, Neil Diamond, and others. It can get noisy on weekends, with lots of tables having a good time watching Fortucci or the Red Sox on the flat screen just above his head. We crack up when the eggplant Parmesan ($11.95) arrives. It’s a platter for two. For once, the eggplant is not dwarfed by a mountain of pasta, but there’s plenty of both. The eggplant is sliced just thin enough so that it’s not soggy, the marinara sauce is robust with fresh basil. Meat eaters might like the Eight/10 mixed grill ($11.95), a trio of grilled steak tips, turkey tips, and sweet Italian sausage. Steak tips are cooked as ordered, medium rare, and are juicy, as is the sausage. Chicken is a tad dry. Mashed potatoes are slightly lumpy and buttery, just right, and there’s a pile of sweet corn. We try the fish special, haddock, “any way’’ you want it: fried, baked, in marinara or white wine sauce ($15.95). Ours is firm but flaky, with herbed bread crumbs. There’s garlicky spinach and seasoned hand-cut fries on the side. For dessert, an imaginative apple ravioli ($7.50) is drizzled with caramel sauce and served with vanilla ice cream. Dense and dark molten lava cake ($7.50), gooey in the center, comes with whipped cream and raspberry sauce. We think Elvis would approve - and have one of each. The 8/10 on the Phantom Gourmet! Content copyright . EIGHT10BARANDGRILLE.COM. All rights reserved.